Thinking about buying a Siberian Husky puppy? And - we want to emphasise - they shed a lot of coat! concerns should be health and temperament. and each is special in its own way. your family dynamic and needs. 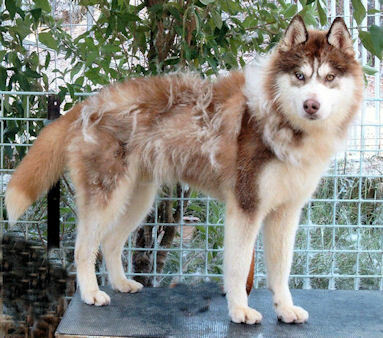 Some Huskies have a much longer than usual and / or woolly coat. This is a genetic throwback and has occurred in litters from all kennels. The pups are very cute and have the best temperaments - always gentle, friendly and even tempered. This is such a bonus as long coated Huskies need daily grooming, with a long weekly session - a large commitment of time which needs to be considered before taking in a long coat pup. Failing to groom out the very fine and woolly undercoat results in a matted, knotted and dirty coat which can harbour fleas and grass seeds and often leads to hot spots - itchy, weeping skin lesions which easily become infected and painful. Before buying a long coated Siberian Husky, PLEASE read the attached article and look at the pictures of neglected long coated dogs. Here is some information about our philosophies on producing quality Siberian Huskies, and how we look after our dogs at "Mikulov". We have been involved with Siberian Huskies since 1988, and both of us have had previous involvement in other breeds of dogs in conformation and obedience spheres. This emphasises our long term dedication to the Siberian Huskies we have, as well as to the breed in general. All of our Siberians are registered, pedigree dogs, and those we breed with are of above average quality, in terms of conformation and temperament. We do not breed for specific colours of coat or eyes, as the spectrum of colours from pure black through greys and reds to pure white is equally acceptable. To us, the correct physical structure and temperament of a dog is of utmost importance. We are proud of the dogs we are breeding and are happy to have them live out their lives either with us or with other families, as they are good looking and well behaved companions with loving and amiable temperaments. All of our pups are healthy and happy and all are raised with the same love and care regardless of whether they are destined to be a show Champion or someone's cherished companion. After doing as much as we could with the old style Siberians common through the 1980s in Australia, our research drew us towards the more "American show style" of Siberian, a dog which is moderate in bone, with a pretty face and refined head, topped with small close set ears, and often quite compact in body. Careful breeding over generations have solidified this attractive look. We follow the diet recommended by Dr Ian Billinghurst in his book "Give Your Dog A Bone" which is based on raw meaty bones (chicken carcasses, lamb brisket or beef ribs) supplemented with eggs, canola oil, Cod liver oil, and vitamins C and E and zinc. Our dogs come inside the house in the evenings and get on well with any human guests and each other. Mara obedience trains each dog to the highest level it is comfortable with, either to have better house manners or to be trialled in the Community Companion Dog / Rally O Novice obedience ring. Our dogs are very quick to learn and retain the exercises and so they are quite amenable to training. Our Siberians are typically laid back and love people. In public, they enjoy the attention of complete strangers and will ask to be patted and cuddled. They are not disturbed by crowds of people pressing around, strange dogs, bicycles or loud noises such as musical bands and heavy vehicles. At conformation shows it is very common for one or another of the Siberians we have entered to get a Class in Group award, and Puppy Sweepstakes wins and placings are common with our younger Huskies. Most of our dogs are broken to harness and we are regularly invited to demonstrate the dogs working in harness, and to bring Santa on his sleigh to Christmas parties. We exercise our dogs by running them alongside a bicycle. Our adults are X-rayed and scored for hip dysplasia as a routine procedure and have their eyes tested several times through their lives. We have hip scored more than 50 Siberian Huskies which we either own or have bred. As conscientious and dedicated breeders, we know we have done everything possible to ensure that all our pups will grow into healthy dogs, free of physical handicaps and capable of leading long, healthy and pain free lives as companions and pets. The breed has a life span of 14 or 15 years and they are generally healthy until the very end of their lives. was the oldest living Husky in Australia for some months through 2004, and had an exceptionally long life. As many of our current dogs are descended from Chi, it is reasonable to expect a long and healthy life for your pup. As members of Dogs ACT and registered breeders with the Dogs NSW, we abide by the Code of Ethics which have guidelines about how young (and how old) females should be before having puppies, vaccination and worming regimes for puppies, how old puppies must be before they can be separated from their mother and many aspects of dog care and welfare which help ensure that we produce healthy, happy puppies for you to enjoy for years. We are members of the Siberian Husky Clubs of New South Wales and Victoria. Yes we do sell puppies, when they are available, to suitable show or pet homes. We would only consider selling to a show home if we were confident that the puppy had the qualities necessary to maintain the reputation Mikulov dogs have established in conformation and performance competitions. We also occasionally have an adult show champion needing a retirement home. These dogs are usually 2 to 4 years old and are obedience trained. We consider the quality of the home a top priority for these older dogs and are willing to negotiate a price to fit your budget.